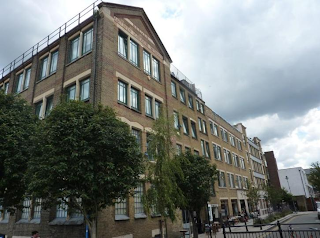 Transport for London , with its partners Taylor Wimpey, have re-applied to Hackney Council for planning permission to build a 90% private gated community on Dalston public land. The original plans were withdrawn last January and, following some design changes, TfL claim Hackney planners now back it as an "exemplar design". 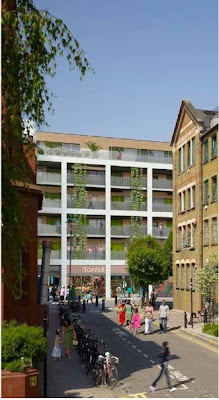 Hackney deny that, but confirm that "revised proposals addressing previous concerns" have been lodged. You can see the planning application documents here . 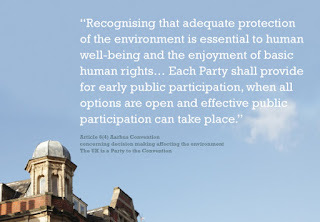 We urge you to let Hackney know you views. The two sites, northern and southern, are above TfLs Western Curve rail link, which runs from Dalston Juction towards Canonbury. Hackney has contributed over £1million towards building concrete slabs over the tunnels to support taller buildings. Hackney & TfL have both ignored OPEN's Freedom of Information requests for details of their deal so any conflict of interest will not be made public. Of 106 'units' to be built on the two sites there will only be 9 flats for social rent - that is 8.5% whereas the Council and GLA policies aim to achieve 35% for social rent (ie 37 flats in this case). There are some 9,000 overcrowded families with children living in Hackney. The test for whether it's "financially viable" to provide affordable housing assumes a 20% developer profit on investment ie £200K profit for every £1m spent. The difference here though is that this is public land with investment already paid for by the public. Where is the public benefit for Dalston from the development TfL are proposing? The developers are trying to maximise their returns by overscale buildings - at the permanent expense of our local environment. Last year they appealed to the Government Inspector against the Council's policy of 4-6 storeys for the sites. 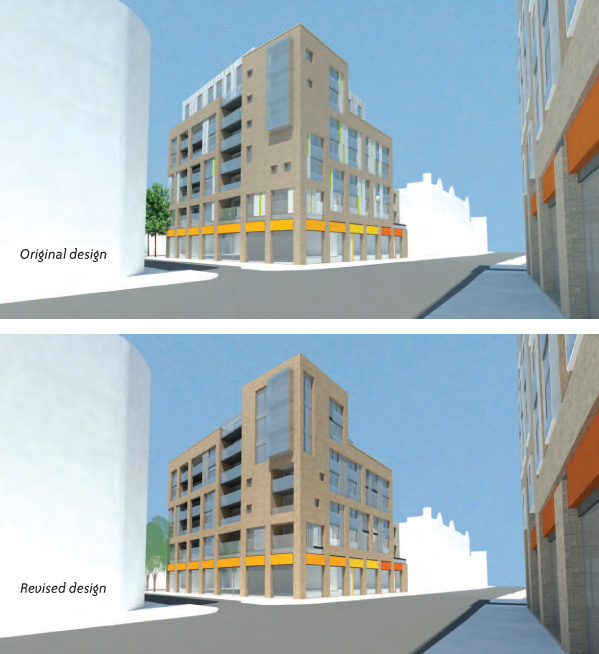 Their appeal failed, but nevertheless their current application is for 6-7 storeys. TfL have a history - look at The Slab and Dalston Square. 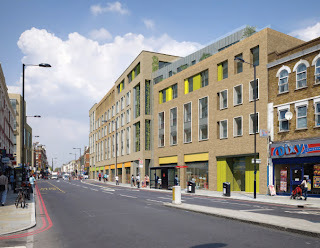 The proposed block on TfL's southern site at Dalston Junction by Ashwin Street. Design changes include adding more balconies and replacing cheap materials with more expensive finishes. Dalston is one of the most densely populated wards, and one of the most deficient in green space, in London. All of TfL's public land will be privatised by enclosure within the sites, with no open or green space accessible there to the public.TfL says that Hackney opposes new public space but the Council's design guidance for the sites states that "new and improved areas of green open space and/or public realm will be encouraged" and Hackney's guidance is also consistent with GLA policy. TfL also imply the police don't want any public open space for safety reasons. Happily, TfL's eco-consultants have been able to confirm that no foraging badgers, otters or great crested newts will be put at risk by its development in Dalston. Sadly, TfL will be providing no play space for children living in the development or locally. 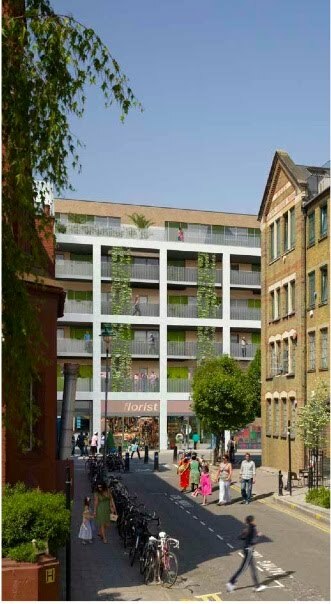 TfL's consultant's report states that the design of the northern site is such that overshadowing will be "Substantially Adverse" for this Edwardian terrace, which includes upstairs living accommodation . Even the privatised amenity space for residents within the new development will be 90% overshadowed. The new blocks will loom over the surrounding buildings. This fine 1903 terrace at 37-49 Kingsland High Street includes listed buildings but they will be reduced to below British sunlight standards. TfL have not commissioned further studies despite their consultant's recommendations to do so. The 6-storey block on the Southern Site, which will extend up Kingsland High Street east side, will enclose Ashwin Street and conceal views of the recently restored Reeves and Son building and the Shiloh Church. 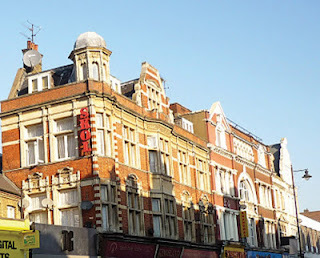 They have always enjoyed an open aspect, with good sunlight, because there were one and two storey buildings on the site before TfL demolished them to work on the tunnels. TfL's sunlight consultant has not reported regarding the lower floors of the Reeves and Son building's west elevation because, TfL says, sunlight there is "not required". The building will be enclosed and overshadowed by TfL's 6-storey development. Ashwin Street will become a "shared space" for HGV delivery vehicles ( to do three point turns) and pedestrians. TfL's proposed 6-storey block will extend up the High Street and enclose the west side of Ashwin Street. You can see the planning application documents here and, before it is too late, Let Hackney know your views. Do it NOW here.